xInvest Consultants: Where do alkaline batteries belong in a portfolio? Where do alkaline batteries belong in a portfolio? For those of us who have spent decades analyzing the alkaline battery business, it has been interesting to watch this struggle. There is no doubt that alkaline batteries are consumer products but whether they belong in a portfolio with other technologically-unrelated products is debatable. It wasn't always so, but now that we have some historical information to analyze, we can look at this question with a more critical eye. 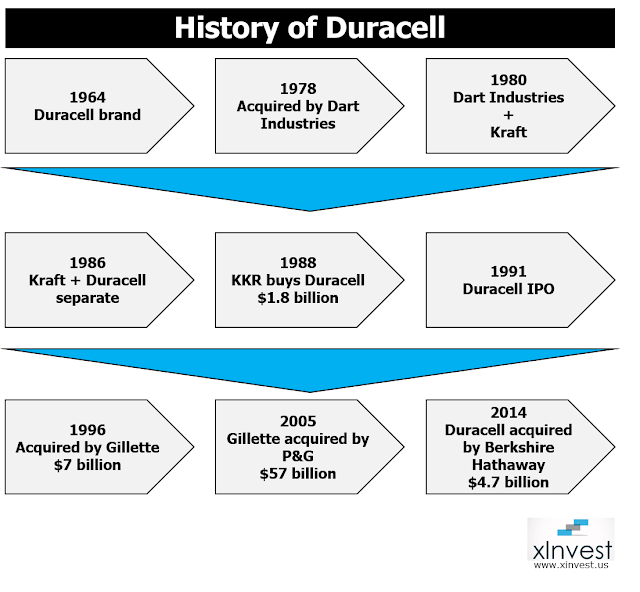 As can be seen in the chart below, Gillette was convinced in Duracell was convinced in 1996 that Duracell fit so nicely with razors. After all, there were many similarities in how these two products were marketed, distributed, and sold. We now can look back and conclude that it was a failed strategy. When Warren Buffet buys a company, it simply means that batteries are best sold all by themselves. In this failed attempt, though, a lot of shareholder value was destroyed, unless you were a Gillette shareholder in 1996. As I said above, not only was Gillette convinced that alkaline batteries belonged together with razors, others in the industry also believed that it could work. When a razor company would/could not buy them, Energizer decided to acquire Schick in 2003. The logic about batteries in a portfolio of consumer package goods was so convincing that Energizer Holdings acquired other personal hygiene products. Ultimately, as alkaline battery business reached a maturity phase, they realized that it is best to discard them from the portfolio. 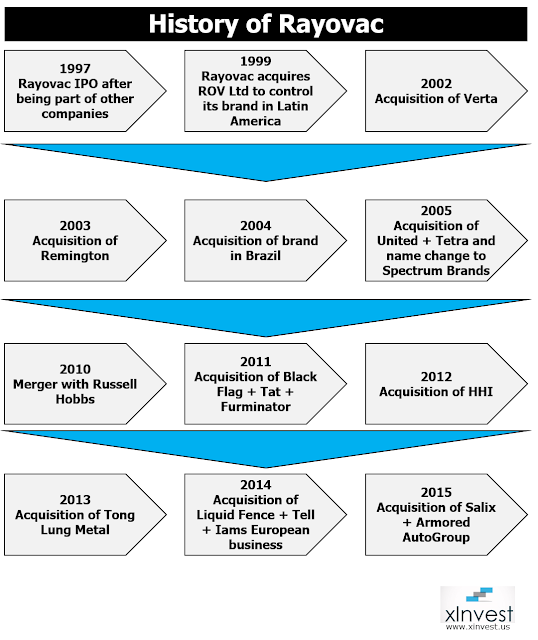 When will Rayovac realize that it must rethink its portfolio composition? 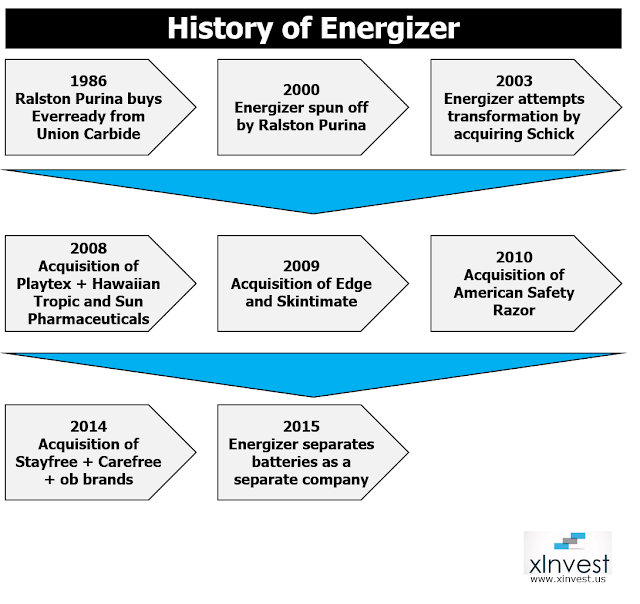 If the case studies of Duracell and Energizer are an indicator of what is best for a company that owns alkaline batteries in its portfolio, it is time for Rayovac to review its portfolio. It is continuing to diversify its portfolio with the addition of other packaged goods, but alkaline batteries may drag its growth and profitability. As a consultant, I always tell my clients to pay attention to case studies. Obviously, there are instances in which examples are not available in your own industry, but in many cases, it might be even more useful to look at cases from other sectors. Generally speaking, mergers destroy shareholder value and complex product portfolios are recipes for disaster, but we can all agree that alkaline batteries are such unique products that they deserve to be left alone. About: Jay Dwivedi is a consultant to the battery industry. He maybe contacted here.